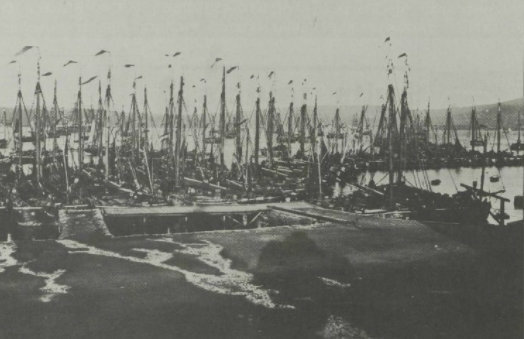 Dutch fishermen had their base on the Shetland Isles . Dogs en peppermint were well known articles for the Dutch herringfishermen. The dogs from Lerwick were earthenware en was a souvenir in many fishermens house on either side of the clock on the mantelpiece. as the postman delivered a card from Shetland .He shouted "mother they have gone for doggies"
at the end of the last century the Dutch bomships sailed to Shetland at the end of May. In the weekends the like to enter Lerwick .They did not liked to be out at sea on a Sunday. But to do some shopping or maintenance as well . When anchored, the men went ashore. First to the postoffice to collect or send telegrams and postcards . Then for a walk in the long and winding headstreet of Lerwick,Commercial street. The fishermen bought huge amounts of peppermint. After buying peppermint often followed an other purchase.The acquisition of two dogs. Not made in Shetland but made in England. Although the tobacco ,sold as Dutch hurl by the Scots was available in the shops ,the fishermen brought there own tobacco to trade with the Shetlanders. The last Saturday of June was known in Shetland as "Dutchmen 's Saturday". It was the busiest day of the year in Lerwick. In commercial street the sound of the clogs en the smell of the Dutch sigars was very existing. After June it was not so busy anymore,because they went to more southern fishinggrounds. Near Lerwick is the lighthouse of Bressay it stand on a picturesque rock with a natural gate underneath. The Katwijk fishermen called it Granny's gate . Everytime they passed this gate they would throw a penny overboard . Only this way you had a safe arrival.